The Order: 1886 is an incredibly atmospheric game that continually wants you to know it, never failing to show off the power of the Playstation 4. Environments are amazingly detailed, and I would even go as far to say it's graphically the most impressive title I've played on current generation consoles. Unfortunately, this is where most of my praise for Ready at Dawn's new IP ends. The Order is set in the beautiful city of London. You are Sir Galahad, a renowned member of The Order, an organization of knights that protect the world from man/animal half breeds know as Lycans. The war has escalated between humans and Lycans which resulted in the humans crafting some pretty extraordinary inventions. The story, which initially seemed to hold promise especially due to the fact that the production value for the game is noticeably high, was disappointing overall, thanks to the pacing of the plot and abruptly it ended. With the high quality of the production, I just wished the quality The Order'sgameplay (or lack thereof) was just as high. The majority of the time playing the game, I was doing one of two things. Either I was watching a cutscene or walking down a linear path until I was hit with another cutscene. When it wasn't one of those two things I was engaging in some pretty bland combat. The Order is your traditional third-person shooter, though I did really enjoy some of the weapons, such as the Thermite rifle which allows you to set enemies ablaze. Other weapons, like the Arc Rifle, are a blast to use as well, but with the majority of things in this game when there is something good, there seems to always be something bad accompanied with it. The best weapons in the game you barely get to use as the access to them is extremely limited. Even later in the game these cool weapons only show up for a scene or so. As astounding as the environments are, the only real interaction you have available to you are quick-time events that play a heavy role in the gameplay. I've never been completely against QTEs if they are utilized right, and The Order does use QTE's in pretty cool ways when you are fighting against the Lycans. One misstep against these half breeds will usually end up with your neck being ripped from your shoulders. That kind of intensity is what I like to feel when being forced to use QTEs. Unfortunately, these occasions don't appear very often. Instead, more than often when a QTE comes your way, you'll be doing tedious tasks such as pushing a truck, forcing doors open, or another task that is more annoying than intense. Where the game does shine however is when you come across the horrifying Lycans. The Lycans like to hide in the dark and try to sneak from behind and deal Galahad a gruesome death. These battles are definitely impressive but they don't happen nearly as frequent as they should. When you aren't fighting those atrocities you are fighting some disappointing, bland, generic enemies. The combat isn't anything to write home about. The cover system works as it should but even that can be troublesome due to Ready at Dawn's decision to add black letterbox bars at the top and bottom of the screen. Similar to QTEs, I don't mind this decision if it had been implemented right. During those long cinematic walks from cutscene to cutscene the letterbox would surely make it seem more cinematic but during firefights it's just frustrating. The field of vision suffers because of this, in turn making combat annoying especially when behind cover. You can't really see much of your surroundings. The firefights themselves are just as bland as the enemies. Each firefight was just like the one before it. A group of guys surround the area and you just take potshots until the final body drops. None of these encounters forced me to use different tactics which resulted in each firefight becoming the same tedious shootout until your clear to proceed. Outside of a missed collectibles if your into trophies, there really isn't any reason to go back and play the game upon completion. There isn't any multiplayer, new game plus, or any other incentives to encourage a second playthrough or add more hours to an already short game. Even with the lackluster gameplay, I was continually impressed with the amount of polish and graphical fidelity. Character models and voice acting especially shined. There's a dark tone to the game and the use of color reflects that. Black and grays are used perfectly to compliment the darker plot. I also didn't run into any technical issues either. 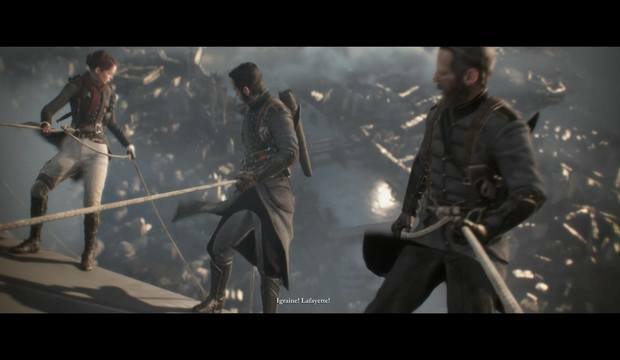 The Order: 1886 is such a great looking game, and it's sad that the gameplay couldn't be just as impressive. The game falls victim to the old cliche "All flash, no substance". The cinematic experience is overshadowed by the boring gameplay leading to a visually stunning game but unimaginative, monotonous overall experience. Metal Gear Solid V: The Phantom Pain is the culmination of decades of an acclaimed series that repeatedly raised the bar with every entry. The storytelling may not please everyone, especially the initiated, but this is unquestionably the best gameplay in a Metal Gear game. Hideo Kojima has given the player more control than ever before and it translates to an incredibly fun game to play, and a fitting end to one of the most influential game series of all time. Dying Light just about fires on all cylinders. The immensely satisfying gameplay, stunning visuals, and horrifying nights makes this easily one the best survival horror games to come out in the last couple of years. Simply put, #killallzombies feels like half of a game. The gameplay feels great and fluid but unfortunately the game never meets its potential. The unique streaming options, interesting perk system, and fun combat doesn't do enough for a unfinished product that has more locked game modes than game modes available for play.